The Allergy and Immunology Foundation of Australasia (AIFA) is pleased to announce that the 2018 AIFA research grants has been awarded to Dr Md. 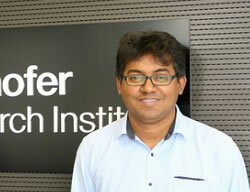 Ashik Ullah of the QIMR Berghofer Medical Research Institute in Brisbane. AIFA received a total of 21 expressions of interest for the 2018 grants round, spanning food allergy, antibiotic allergy, allergic asthma, common variable immune deficiency (CVID), Graves Disease and anaphylaxis. After a lengthy and difficult selection process, the AIFA Board is pleased to announce that a project entitled “P2RY13 – a novel therapeutic target for allergic asthma” led by Dr Md Ashik Ullah of QIMR Berghofer has been chosen as the recipient of a $30,000 AIFA research grant. This brings the total AIFA grant figure to $160,000 in the last 5 years. Asthma is a chronic lung disease affecting millions of Australians. There is no cure for asthma and current treatment options for asthma are merely supportive. Asthma affects people of all ages, but most often starts during childhood. Sensitisation to allergens is one of the major risk factors for asthma onset. Dr Ullah, a respiratory immunologist, is investigating the consequences of allergen exposure in the lungs and the processes that predispose to allergic sensitisation. The airway lumen of the lungs is lined by airway epithelial cells, which in response to allergen exposure, release innate inflammatory mediators or ‘alarmins’. Dr Ullah has shown that these alarmins promote the allergic inflammation that contributes to airway wall remodelling and bronchoconstriction, making it difficult to breathe. A potential treatment approach therefore would be to halt the release of alarmins. Dr Ullah has novel data to suggest that the purinergic receptor P2RY13 regulates alarmin release from airway epithelial cells. Dr Ullah will investigate whether the antagonism of P2RY13 attenuates the release of alarmins in response to different allergens. Ultimately, these findings could lead to the development of new therapeutics for the prevention and treatment of asthma. This project has the potential to make real progress in the area of allergic asthma and AIFA is pleased to be supporting Dr Ullah’s work.